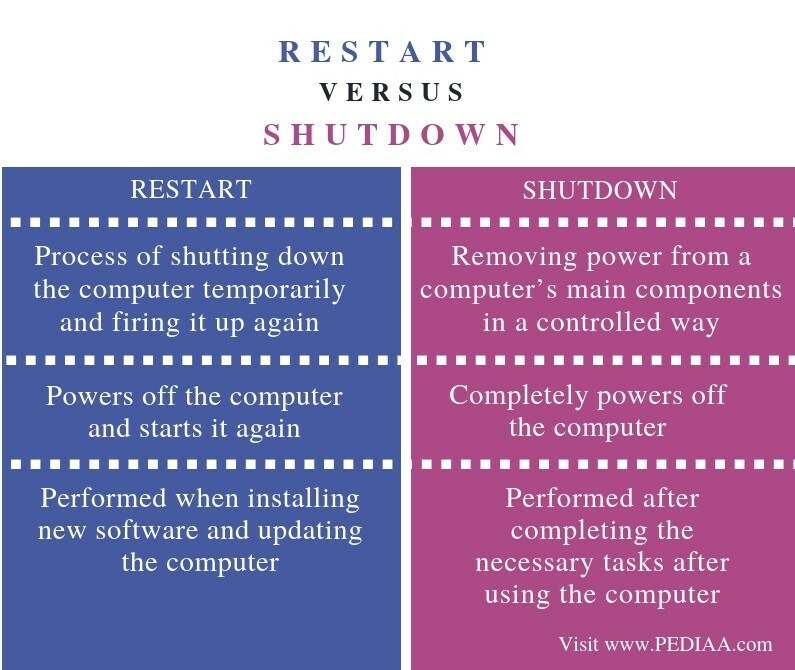 The main difference between restart and shutdown is that restart temporarily shuts down the computer and starts it again while shut down completely powers off the computer. A computer is a digital electronic device that can perform multiple tasks simultaneously. The CPU controls all the functionalities of the entire computer system. There is RAM to store temporary data and ROM to store permanent data. There are input devices to send data to the computer and output devices to display the processed results. There are various operations related to a computer. Restart and shutdown are two of them. Restart is the process of shutting down or powering off the computer temporarily and starting it again. It is necessary for tasks such as installing updates and installing new software to the computer. Restarting helps to confirm that the updates have installed correctly. Furthermore, it ensures that the software works as required. The most common method to restart a computer with Windows 10 is by clicking on the start button on the lower left corner of the screen. Then the user can go to the power option and select restart from the available options. Users can select the power button in the upper right corner of the start screen in a Windows 8 machine to select the restart option. 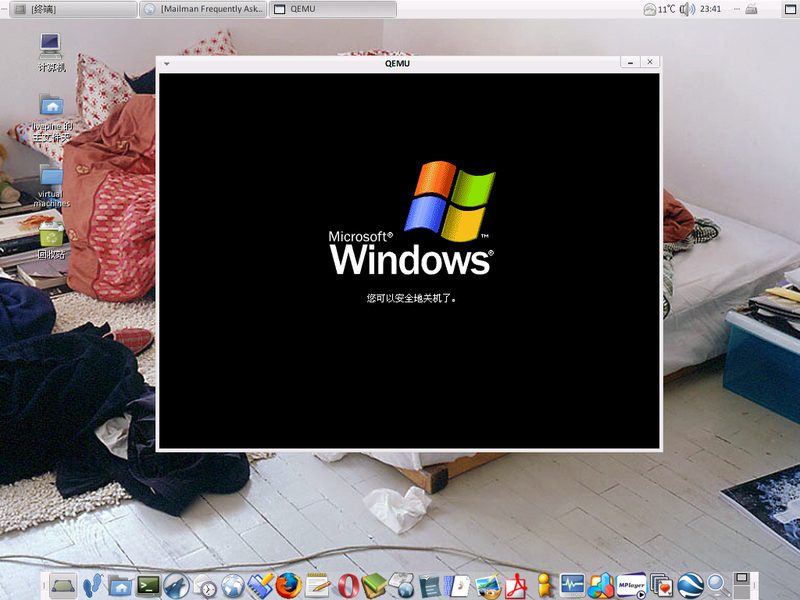 Furthermore, the user can go to start button and click the small arrow in the lower left corner to click the restart option Windows 7 or Vista machine. Shut down is the process of closing all the programs on the computer and turning off the computer’s power. The last program to close is the operating system. It is essential to shut down the computer properly to avoid data corruption. The user may be browsing the internet, typing word documents, using software such as Photoshop, playing a video game or developing a computer program. After completing the tasks, the user can shut down the machine. The most common method to shut down the computer with Windows 10 is by clicking on the start button on the lower left corner of the screen. Then the user can click on the power button and choose shut down option. The user can select the power button in the upper right corner of the start screen in a Windows 8 machine to select shut down option. Furthermore, the user can go to the start button and click the small arrow in the lower left corner to click the shutdown option in a Windows 7 or Vista machine. Restart is the process of shutting down the computer temporarily and firing it up again while shut down refers to removing power from a computer’s main components in a controlled way. Thus, this is the main difference between Restart and Shutdown. Restarting powers off the computer and starts it again while shutdown completely powers off the computer. Another difference between Restart and Shutdown is their usage. Restart is performed when installing new software and updating the computer while shutdown is performed after completing the necessary tasks after using the computer. The user can start the computer again later when required. Restart and shutdown are two terms that are used interchangeably. The difference between Restart and Shutdown is that Restart temporarily shuts down the computer and starts it again while shut down completely powers off the computer. 1. “How to Restart Microsoft Windows.” Computer Hope, 1 Apr. 2018, Available here. 2. “How to Shut down a Computer.” Computer Hope, 5 Jan. 2018, Available here. 3. “What Is Shut Down?” Computer Hope, 1 Mar. 2018, Available here. 4. “Shutdown (Computing).” Wikipedia, Wikimedia Foundation, 3 Feb. 2019, Available here.